If only you could scratch this Lemon Verbena leaf and sniff! Lemon Verbena plants were brought to Europe by Spanish explorers in the 17th century from Argentina and Chile. There it was grown for its fabulous lemony oil that was used in perfume and cosmetics until cheaper Lemon Grass oil replaced it. Because Lemon Verbena leaves keep their scent well when dried they were a popular with the Victorians as an ingredient in their endless making of potpourri. Aloysia triphylla is named after Maria Louisa (Aloysia is thought to be a derivative of Louisa) the princess of Parma and wife of King Carlos IV King of Spain. Triphylla refers to the placement of the leaves (phylla) which are arranged in whorls of three (tri). Lemon Verbena is a rapidly growing elegant shrub that can reach 15 feet with tropical conditions. Here in zone 8 Lemon Verbena plants reach about five or six feet and then sprawl about. 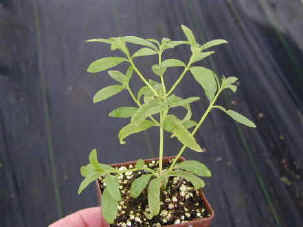 If it is not placed in full sun, Lemon Verbena plants will get tall and spindly and the oils will not develop as well. The oil glands of the Lemon Verbena leaf are on the underside of the leaf and are used to cool the plant during hot summers. 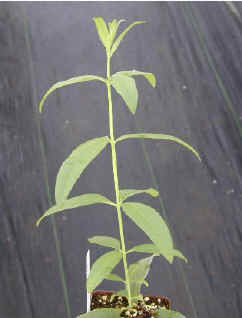 This spindly main stem of this small Lemon Verbena plant was topped, which, as you can see below, forced the side branches to grow. This produces a sturdier plant in the pot and the garden. 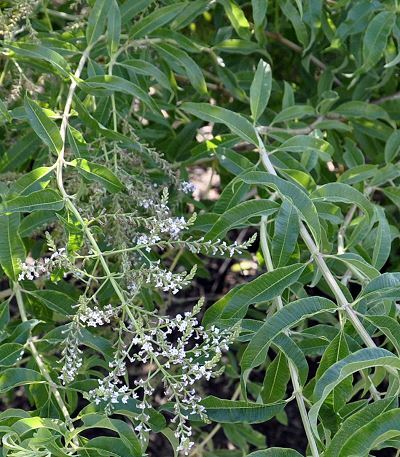 Due to its South American roots, Lemon Verbena likes it hot and needs plenty of of sunlight. Plants grown in shade will be less flavorful. In frost free areas, Lemon Verbena plants remain evergreen. When exposed to light frost, Lemon Verbena shrubs become deciduous, dropping their leaves. Mature plants, well mulched in the field, can survive brief temperatures as low as 6 degrees, at which point the Lemon Verbena plant will become herbaceous (dies all the way back to the ground). Cold area planting should be done at the earliest possible time in spring so the Lemon Verbena plant can become well established pushing its roots deep into the soil developing the largest caliper trunk possible before winter. Lemon Verbena emerges late in spring. Pruning should take place after the branches have budded and you can tell which branches are dead. If you wait too long, the old dead branches become a tangled mess with new branches and it becomes much harder to prune. This is also a good time to prune other Lemon Verbena branches that might be in the way of other plants. Lemon Verbena flowers are small, white, single and inconspicuous. Their airy feel is an elegant crowning point for the open form of the plant. Lippia triphylla, Lippia citriodora, Aloysia citriodora, Verveine citronelle or odorante, Herb Louisa, lemon scented verbena, Verbena triphylla, and Lippia triphylla; Lemon Verbena has had many names in the past but no matter what it is called its flavor and fragrance of lemon is second to no other lemony herb. 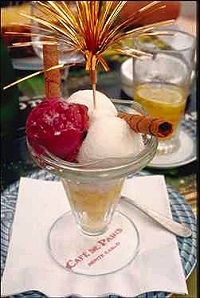 The flavor of Lemon Verbena is reminiscent of lemon candy, sweet with strong lemon and no sourness. Cooking with Lemon Verbena is a fun experience. Like most herbs it has its own flavor profile that, while very close to lemon, has an extra essence that can best be described as an earthy freshness. Leaves and flowers can be used both fresh and dried. Lemon Verbena leaves can be harvested anytime for drying. 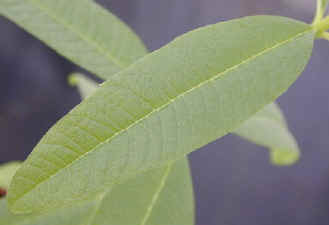 Lemon Verbena leaves are thin and dry quickly. After cutting the leaves, they should be washed and lain flat or hung in small batches to dry. Pick a nice dark spot with good air circulation or cover lightly with a paper towel. Bunches can be loosely placed in paper bags. The important thing to remember when drying any herb is to check daily for dryness. As soon as the herbs are dry (when they crackle and crumble in your hand) they should be placed in an air tight container out of the light. Dried Lemon Verbena leaves and flowers can be powdered and sprinkled on veggies or fish or combined with other dried herbs to add a subtle hint of freshness. Fresh Lemon Verbena leaves are used to make sun tea, soak in liquid for sugar syrups, make flavored liqueurs or make flavored oils. For making dishes where fresh leaves will be eaten (like a pesto) the young leaves are more desirable. To make a simple Lemon Verbena oil for marinades or salads, combine one cup fresh Lemon Verbena leaves with 1/2 cup grape seed oil in a blender. Blend on high for at least 2 minutes. Let stand at room temperature for an hour or two. Strain through a fine mesh strainer. Use immediately or refrigerate. Lemon Verbena oil keeps about a week in the refrigerator so it is better to make small batches often. Chop just half a cup of fresh lemon verbena leaves and put in a jar. Add 4 cups of vodka and let sit covered for two weeks, shaking every once in a while. After two weeks, add 2 cups of sugar and shake to dissolve. Let THAT sit for two weeks. Strain out the leaves, bottle the gloriously fragrant, delicious liqueur and either add it to desserts, or seltzer. If you REALLY want to drink it straight, I suggest doing that by the THIMBLEFUL!!!! It honestly tastes JUST the way fresh Lemon Verbena leaves smell. Recipe is courtesy of Weeds and Wild Things. For more Lemon Verbena recipes, please visit our pinterest board here. This plant is often available in plug trays. These trays hold 128 of all the same plant. They are a great low cost way to fill a lot of space. Each cell is 3/4 of inch by an inch. Check here to see if Lemon Verbena Plug Trays are available. Lemon Verbena is one of the six plants chosen to be in our Zone 8-11 Fragrant Herb Garden Six Pack.